From the Latin American Newspaper, Cronica Latina: Magical harp music and poetry, characteristic of Ricardo Curbelo's artistic, theatrical and musical career. A wonderful introduction into a completely different expression of harp music beautifully expressed. Thank you. Susie. We loved the music, enchanting, magical and beautiful. 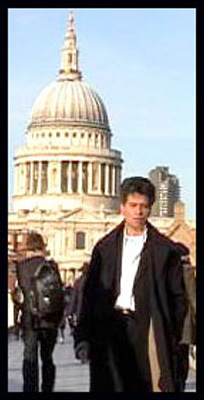 Richard Dibley (Chairman, Anglo-Colombian Society, London). Ricardo, mil gracias por este hermoso recital, eres un genio de la música y compositor extraordinario. Alicia Díaz-Cala. From Dulwich Picture Gallery, London: Ricardo and David ...what a great evening, we all enjoyed it so much. A total success! Thanks for a fantastic lively performance. The students had a wonderful time. Thank you once again for coming to play for us. Almost without exception the students thoroughly enjoyed your performances, from those with the most profound difficulties, to the small groups of mainstream boys from Rokeby School next door – and of course the staff! The variety of moods you created with the harp, cuatro, maracas and vocals kept everyone interested, if not fascinated. As you saw, the students loved accompanying your rhythms with their own movements, clapping and vocals. Also, allowing them to explore the harp afterwards was a real winner, especially as it is an instrument most would never have encountered and certainly not heard being played in this way. The expressions on the faces in the enclosed photos, I think, tell it all. We hope you got back safely and with speed. Thank you for making our evening so very memorable and creating such a special atmosphere...deep quiet listening is so rare in an audience these days...I think your perfect playing took everyone’s breath away...thank you, thank you for all those years of practice that have made it all seem so easy and delightful on the night. We hope very, very much to see you again soon. I will write to Julian Hubbersguilt in the New Year and tell him what a great success our evening was. Gracias por la espléndida noche por los caminos de Colombia. Ingrid Aragón. ...he has a command of Latin American harp music second to none. From Director James Cape, Photolibrary Group Ltd. London Ricardo really added some star quality to a client event that we recently held in Covent Garden. He gauged the mood of our clientele perfectly and responded accordingly. The event was a huge success and I was delighted that Ricardo was there to play an integral part. are very rare and we must wait and pray for next year. Ricardo, Thank you for playing so lovely for my wedding, we never thought we would have such a fine artist from home here in England, God bless you. Ricardo, thanks, It was perfect, your playing and the sound of your harp was wonderful, everybody enjoyed it! Dear Ricardo, many thanks for your lovely recital at our wedding reception, The guests and the hotel's Events Organizer were very impressed by your performance.